Broad Run High School alum Connor Jessop is hoping to ride a huge senior season and a head-turning pro day to a late-round NFL draft selection. BRAMBLETON, Va. — If the NFL Draft is really about anything for most fans, it’s about quarterbacks. The opportunity to land a team leader and signal-caller who could change the trajectory of your franchise for years, even decades, is tantalizing for any franchise. And, as we all know, that pick could come from places you least expect — like North Dakota State or Miami University of Ohio — and from any point in the draft, from the third round, to the fourth round, to the 199th overall pick. This year’s quarterback class is perhaps the biggest, broadest group in recent memory. As many as six QBs could realistically be selected in the first round alone: Josh Allen, Sam Darnold, Lamar Jackson, Baker Mayfield, Josh Rosen and Mason Rudolph. But there’s a local quarterback who has caught the eyes of a number of teams heading into this week’s draft, enough to perhaps turn himself into the latest late-round, diamond in the rough story. Connor Jessop has run into some bad timing in his life. As a high school junior — the prime recruiting year for prep athletes — he broke his collarbone just four games into the season. Despite the fact he was coming off a state championship season as a sophomore, interest waned. He was rated a two-star recruit by one amateur scouting service, just a one-star recruit by the rest. Rather than let that affect his confidence, he has looked at others who have defied the labels put on them. “I know J.J. Watt was a two-star. I know Eric Fisher, who was the number one overall pick a couple years ago, he was a two-star athlete,” he told WTOP. Jessop’s lone scholarship offer was to FCS Richmond, so he decided defiantly to walk on at his lifelong rooting interest and parents’ alma mater, Virginia Tech. When the coaching staff in Blacksburg changed and it quickly became apparent he would never get his shot as a starter for the Hokies, Jessop realized to have a chance to keep playing, he was going to have to swallow his pride and find a school that would give him an opportunity. For a quarterback in need of guidance and looking for a better path forward, a transfer to Shepherd University is, allegorically, a little on the nose. Located about 10 miles up the Potomac River from Harpers Ferry, West Virginia, just across the river from Maryland, the Division II school turned out to be exactly what Jessop needed. “I’ve always thought that I could play at the highest level, but I think it became a reality once I got to Shepherd and talked to the then-quarterback coach, Joel Gordon,” said Jessop of his former coach, who has since moved up to the Division I level at Iowa State. Jessop’s senior year numbers speak for themselves. He threw 40 touchdowns, more than any Division I quarterback other than Mayfield and Mizzou’s Drew Lock, and did so in just 11 games. He threw just nine interceptions in nearly 400 passing attempts, racking up 3,532 yards. His 63.2 completion percentage rated above Darnold’s and Rosen’s, well above Allen’s. And the Rams finished 10-1. Of course, that came against Division II competition. But there are more Division II players than you may realize in the NFL — 90 in total last year, including practice squad players. More have gotten looks in recent years, thanks to the success of those on whom teams have taken flyers over the last decade. They’re scattered all over the league, from Ravens cornerback Brandon Carr, to Vikings Pro Bowl receiver Adam Thielen, to Pats Pro Bowl corner Malcolm Butler, who made the Super Bowl-sealing interception three years ago. That half-step is often the difference, though, when it comes to getting seriously considered in the NFL. That’s why Jessop sought out an old friend this spring in Rhys Gully, a trainer he has worked with since his junior year as a multisport athlete at Broad Run High School. The two have worked together all spring to give him a chance to make his mark when it mattered most. After a lackluster performance on a cold, rainy day at Shepherd in front of a handful of scouts, Jessop turned heads just two days later at West Virginia’s pro day. In the variety of physical tests that prospects are put through, he posted marks that ranked in the middle or top of the pack among the 19 quarterbacks invited to the NFL combine. He ran the 40-yard dash in 4.77, faster than Darnold, Mayfield or Rosen. His 9’8” broad jump beat them all as well. And at 6’5”, he’s as tall as any quarterback in the draft. Jessop credits those marks to his work with Gully, as he says he was nowhere close to this point when they started working together. It’s been enough that about half the league has been in touch with both Jessop and his agent, and he has been invited to tryouts with both local and NFL clubs. 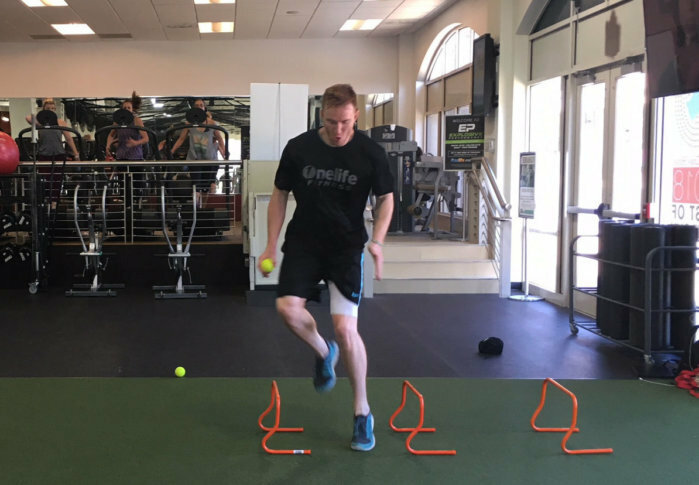 And while the Explosive Performance regimen that Gully put Jessop on isn’t necessarily anything revolutionary, it unlocked his athletic potential in the areas he needed the most improvement, focusing on the areas an NFL player can improve the most. It makes sense when you understand the program’s roots. “We go to the Olympic training center each year. We’ve gone to EXOS to help with their combine training,” said Gully. According to one draft site, the Chicago Bears have shown a lot of interest in Jessop. Draftscout.com ranks him the 26th-best quarterback in the class, but with his stock rising at just the right time. Jessop knows that if hears his name called, it won’t happen until the later rounds on Saturday. But if he has learned anything the past few years, it’s patience with the process. This time, he knows he has done everything he can to put himself in the right place at the right time.